Make the 3rd (Thu) a memorable day with a climbing tour. Spend the 5th (Sat) among aquatic life with a scuba or snorkeling tour. It doesn't end there: explore the wealth of natural beauty at Tunku Abdul Rahman Marine Park. For where to stay, photos, traveler tips, and more tourist information, you can read our Kota Kinabalu travel itinerary planner. Manchester, UK to Kota Kinabalu is an approximately 19.5-hour flight. You can also do a combination of train and flight; or do a combination of train, bus, and flight. The time zone difference moving from Greenwich Mean Time to Malaysia Time is 8 hours. Plan for much warmer temperatures traveling from Manchester in October, with highs in Kota Kinabalu at 37°C and lows at 28°C. Finish your sightseeing early on the 5th (Sat) to allow enough time to travel to Sandakan. Spend the 7th (Mon) exploring nature at Turtle Island Park. 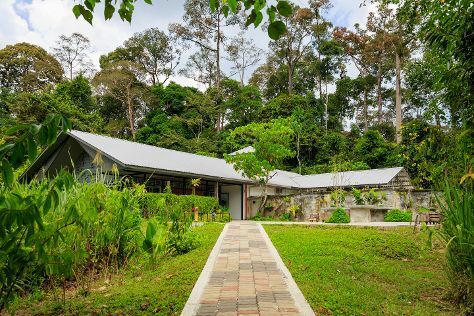 There's lots more to do: look for all kinds of wild species at Bornean Sun Bear Conservation Centre (BSBCC), explore the activities along Kinabatangan River, take an in-depth tour of Sandakan Heritage Museum, and head outdoors with Sepilok Tropical Wildlife Adventure. For reviews, maps, traveler tips, and tourist information, you can read our Sandakan trip planner . Traveling by flight from Kota Kinabalu to Sandakan takes 1.5 hours. Alternatively, you can take a bus; or do a combination of flight and bus. October in Sandakan sees daily highs of 38°C and lows of 28°C at night. Wrap up your sightseeing on the 9th (Wed) early enough to travel to Semporna. 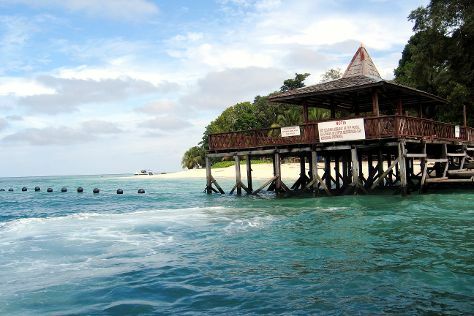 A largely residential city of around 135,000, Semporna has gained popularity in recent years due to its archipelago's good connection to the surrounding islands, including very popular diving or snorkeling destinations such as Sipadan. Spend the 11th (Fri) exploring nature at Sipadan National Park. Spend the 12th (Sat) exploring the interesting area around Tropical Research and Conservation Centre. And it doesn't end there: get outside with Outdoor Activities, head off the coast to Mataking Island, look for all kinds of wild species at Bohey Dulang Island, and kick back and relax at Tun Sakaran Marine Park. To find ratings and tourist information, go to the Semporna trip planner. Getting from Sandakan to Semporna by combination of flight and taxi takes about 2.5 hours. Other options: take a bus; or do a combination of flight and bus. In October, daytime highs in Semporna are 37°C, while nighttime lows are 27°C. Cap off your sightseeing on the 13th (Sun) early enough to travel to Kudat. Close to the northernmost part of Borneo, Kudat has proved popular among tourists for its range of things to do and see, as well as its leafy landscapes and white sandy beaches. Kick off your visit on the 14th (Mon): take a stroll through Kampung Gong Matunggong, then look for all kinds of wild species at Tropical Research and Conservation Centre, then don't miss a visit to Tg Simpang Mengayau, and finally make a trip to Tip of Borneo. To find photos, other places to visit, reviews, and more tourist information, read our Kudat tour itinerary maker app . Use the Route module to find suitable travel options from Semporna to Kudat. In October in Kudat, expect temperatures between 36°C during the day and 28°C at night. Wrap up your sightseeing on the 14th (Mon) to allow time to travel to Kundasang. 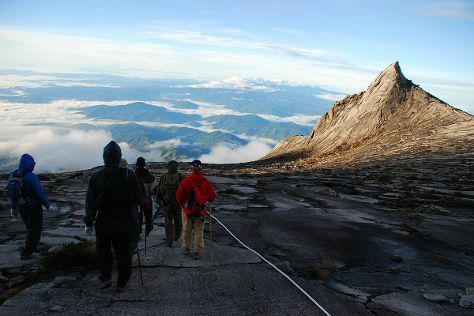 Kick off your visit on the 15th (Tue): take your sightseeing to a higher altitude at Kinabalu Park and then take your sightseeing to a higher altitude at Mount Kinabalu. On the 16th (Wed), you'll have a packed day of sightseeing: take in the dramatic scenery at Langanan Waterfall, appreciate the history behind Kundasang War Memorial, then relax in the rural setting at Desa Dairy Farm, and finally don't miss a visit to Kundasang Market. To find ratings, photos, and tourist information, go to the Kundasang trip planning tool . The Route module can help you plan travel from Kudat to Kundasang. Wrap up your sightseeing on the 16th (Wed) early enough to travel back home.